In 1968 Arabia introduced beautifully designed pattern 'Purpuri jenkka'. 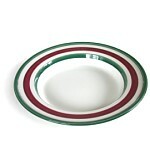 It was made in stoneware with hand painted decoration underglaze in tones of green and red . This striking pattern was the masterpiece of it's designer, artist Ulla Procopé (1921-1968), who worked for Arabia from 1948 to 1968. The shape of each individual dish in this pattern is alike the pieces in her gorgeous 'Valencia'. Ulla Procopé passed away suddenly a few months after 'Purpuri jenkka' introduced to the public. The production of 'Purpuri jenkka' last just couple of years. 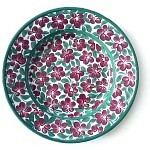 Each Purpuri jenkka dish is hand signed on the bottom with ARABIA Finland and initials of the designer/painter.